(PhysOrg.com) -- Evolutionary biology theory predicts that males usually won't invest a lot of time raising offspring when there is a good chance they are not the fathers. 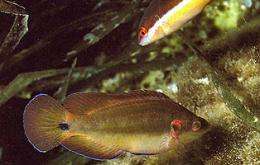 Yale University researchers have found a notable exception to this premise-a male fish in the Mediterranean, the ocellated wrasse, that is more likely to be paternal when there is grave doubt about the offsprings' parentage. Theory also suggests females will look for cues in males that indicate they will make good fathers. However, results of the study — reported this week in the online edition of the journal Proceedings of the Royal Society of London — show female ocellated wrasse deposit more eggs into nests where the potentially nurturing “parental” males are surrounded by non-nesting “sneaker” males, who are also likely to father her young but spend no time raising them. Parental male oscellated wrasse are more likely to care for offspring in this sperm-filled environment than in nests in which there is less sexual competition, said Suzanne H. Alonzo, assistant professor of ecology and evolutionary biology and co-author of the study, along with Kellie L. Heckman, a postdoctoral fellow in the department. Alonzo said that while these findings surprise some evolutionary biologists, they make sense from the perspective of the nesting male ocellated wrasse. While the individual nesting male has a greater chance of being cuckolded when sneaker males are present, he also has a better chance of raising more of his own offspring because females deposit more eggs in nests where there are already large numbers of offspring. Mate selection: How does she know he'll take care of the kids?